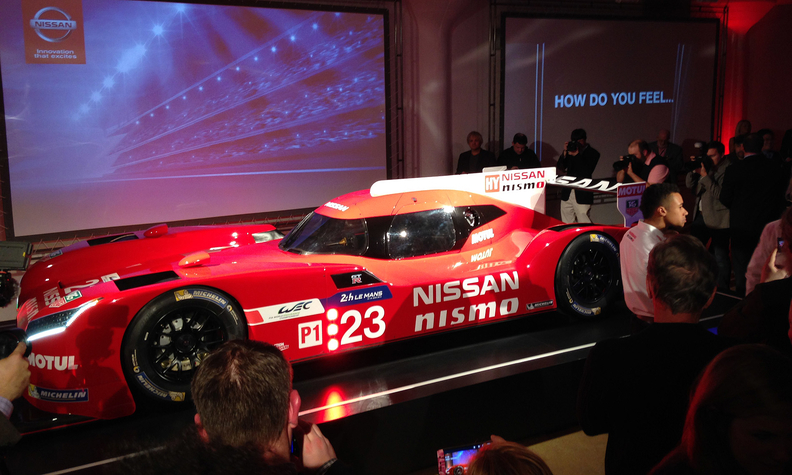 Nissan unveils the GT-R LM Nismo to a crowd Wednesday night just before the opening of the Chicago Auto Show. The racer is a departure from other Le Mans LM P1 vehicles in that it is a front-engine car. The 3.0-liter V-6 twin-turbo is augmented by a hybrid drive system in the rear. The car, which was first revealed in Nissan's Super Bowl ad, will begin racing in the second quarter of this year heralding the company's return to top-class P1 racing.